Tags: Full Sleeves, Light Peach, Party, Semi Formal, Straight Trouser. Peach crinkle chiffon shirt has beautiful embellishments made on neckline and sleeves. Golden colour applique done on hemline. Stand high neckline style with V slit on front. lining inside. Concealed back zip closure. Peach raw silk straight trouser. Concealed side zip fastening. 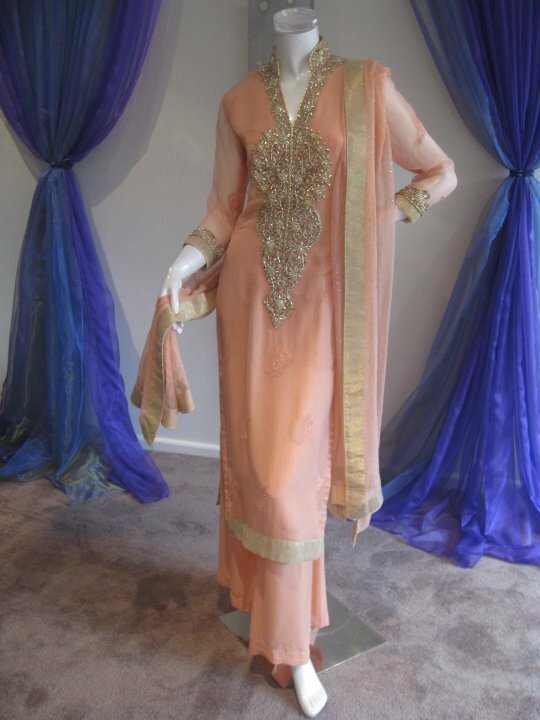 Dupatta/Veil: Peach crinkle chiffon dupatta. Edges finished with golden piping.